The perfect thing for a chilled out, rainy day? A notebook to pen down thoughts and ideas. But the world of notebooks is big and it’s not easy to pick one that fits your style. If you love offbeat ones though, look at this lot. And send us a note about your best finds. We absolutely loved the kitschy covers with eye-popping colours on these. They are all taken from jatra posters – a nostalgic tribute to Bengal’s folk theatre. Navigating Kolkata can be a challenge. This notebook series is a playful depiction of scenes in Kolkata, with illustrated characters and sights and scenes around the city. 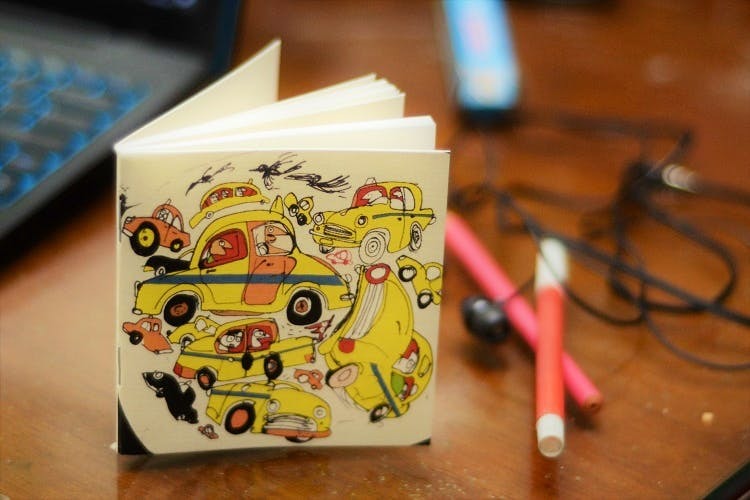 Their amazing book collection apart, you can pick up notebooks with great character at this bookstore in Bhowanipore – Kalighat art covers or limited editions with artist KG Subramanyan’s paintings. You will be tempted to sit down and start jotting after your buy, in one of the chairs strewn around in this wonderful, calming space, amid the chaos of rainy day traffic outside. Just to be on the safe side, we suggest you buy several notebooks together. We have seen that the stores do run out of a particular series sometimes.